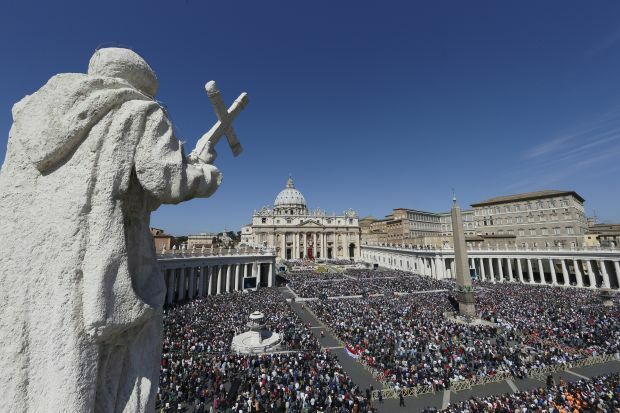 VATICAN CITY (CNS) — Pope Francis urged Christians to remember how they first encountered Christ and to share his love and mercy with others, especially through acts of caring and sharing. 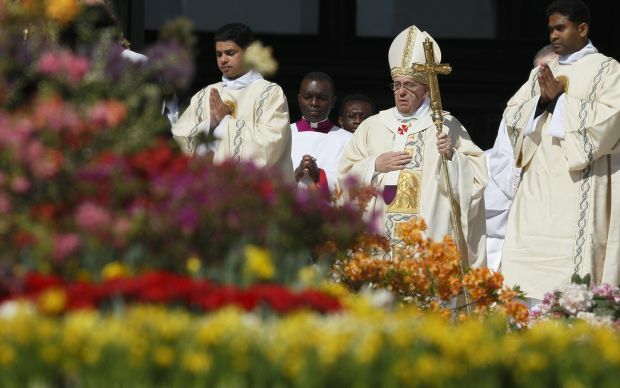 Proclaiming the good news of Jesus’ resurrection means giving concrete witness “to unconditional and faithful love,” he said April 20 before solemnly giving his blessing “urbi et orbi” (to the city and the world). The pope offered special prayers for those facing serious difficulties and threats in various parts of the world: for victims of the Ebola epidemic in West Africa; the victims of kidnapping; migrants and refugees; and for the victims of war and conflict in Syria, Iraq, Central African Republic, Nigeria, South Sudan and Venezuela. Celebrating the fact that in 2014 Easter fell on the same day on the Gregorian calendar used in the West and on the Julian calendar used by many Orthodox and Eastern Catholics, the pope’s Easter morning Mass included a Byzantine choir singing “stichi” and “stichira,” hymns that in ancient times were sung in the presence of the bishop of Rome on Easter. His Easter Vigil began with the lighting of the fire and Easter candle in the atrium of the basilica; walking behind the Easter candle and carrying a candle of his own, Pope Francis entered the darkened basilica. In the silence and solemnity of the moment, very few pilgrims and tourists disturbed the atmosphere with their camera flashes. Brian Baker, a deacon and seminarian from the Archdiocese of Atlanta, sang the Exultet — the poetic hymn of praise calling the whole world to rejoice at the resurrection of Christ. As the bells of St. Peter’s pealed the joy of the Resurrection through the night, torrential rains beat down on Rome. In his homily Pope Francis, who often tells people to look up the date of their baptism and commemorate it each year, urged people to remember and reflect on the first moment they really recall having encountered Jesus. 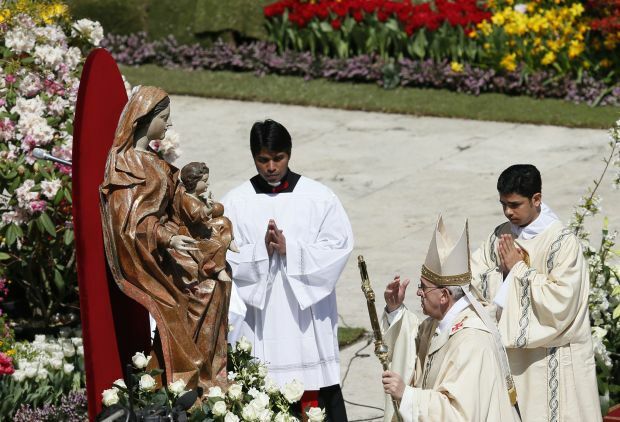 Referring to the Easter account from the Gospel of St. Matthew, Pope Francis noted how the women who went to Jesus’ tomb were told first by the angel and then by the risen Lord to await him in Galilee and tell the disciples to go as well. “After the death of the Master, the disciples had scattered; their faith had been utterly shaken, everything seemed over,” the pope said. Yet they were told to go back to Galilee, the place they first met Jesus. Returning to Galilee, he said, means re-reading everything — “Jesus’ preaching, his miracles, the new community, the excitement and the defections, even the betrayal — to re-read everything starting from the end, which is a new beginning,” one that begins with Jesus’ “supreme act of love” in dying for humanity’s sin. Departing repeatedly from his prepared text, Pope Francis kept telling people: “Have no fear. Do not be afraid. Have the courage to open your hearts” to the Lord’s love. Pope Francis baptized 10 people at the Easter Vigil; they ranged from a 7-year-old Italian boy to a 58-year-old Vietnamese woman. Four other Italians and one person each from Senegal, Lebanon, France and Belarus also were baptized. As each stepped forward, the pope asked if they wanted to be baptized and waited for their response; he asked one man twice because his response had not been clear. The catechumens bent over the baptismal font and the pope, putting one hand on their heads, used a deep silver shell to pour water over their foreheads. The pope confirmed the 10 during the liturgy, anointing them with oil and giving each a kiss on the cheek. And, although Pope Francis does not usually distribute Communion at large public Masses, he made an exception for the 10 new Catholics, who received their first Communion during the vigil.